The Snow College theater department is presenting one of Shakespeare’s most noted comedies, “Much Ado about Nothing”, on Oct. 5 through 8, curtain time 7:30 p.m., at the Eccles Center for the Performing Arts on the Snow College Ephraim campus. Directed by Kris Jennings, the hilarity begins when, after being away at war, comrades Benedick, Claudio and Don Pedro pay a visit to their good friend Leonato, a wealthy man in Messina Sicily. 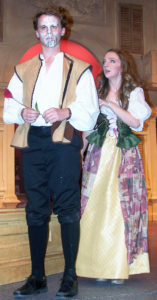 Leonato’s daughter, Hero, quickly catches the eye of Claudio, while Beatrice, Leonato’s niece, immediately starts a war of words with Benedick. As the show unfolds we see villainy, perpetrated by Don Pedro’s brother John. We see laughter, heartbreak, and the truest of true loves.